What conditions does Mirvaso Gel treat? Tell your doctor right away if you have any serious side effects, including: slow heartbeat, dizziness, fainting, pale/whitening skin. 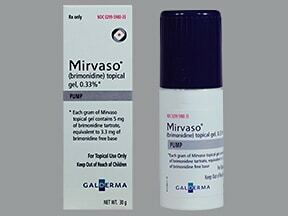 List Mirvaso Gel side effects by likelihood and severity. Before using this medication, tell your doctor or pharmacist your medical history, especially of: blood vessel diseases (thromboangiitis obliterans), blood circulation disorders (cerebral or coronary insufficiency), heart disease, depression, Raynaud's disease, low blood pressure upon standing (orthostatic hypotension), a certain immune system disorder (Sjogren's syndrome), a certain skin/connective tissue disease (scleroderma). What should I know regarding pregnancy, nursing and administering Mirvaso Gel to children or the elderly? 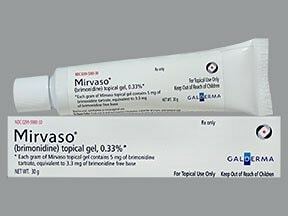 Are you taking Mirvaso Gel? Are you considering switching to Mirvaso Gel? How long have you been taking Mirvaso Gel?